undertook to South Asia in January. the staff remained in Islamabad for further discussions. the center of the Sikh religion. From there we flew to Delhi. Indira Gandhi; Y. B. Chavan, the Minister of External Affairs: J. J.
to Dacca, Bangladesh, on January 11. We left Dacca on Tuesday, January 13th, for Hanoi and Saigon. to cover more of the subcontinent. and asking that the necessary steps be taken as soon as possible. to what should be accomplished and what the obstacles are to success. deal in the limited time available. volunteers in extremely difficult and trying circumstances. severe social, economic and political problems. martial law in the aftermath of the war. In the months after the war. National Assembly was conveyened and martial law was lifted. Minister of a strong, centralized government. se.e many remaining and some deepening problems. implying full support of all the policies of any one country or side. gust 15, Pakistan recognized the new military regime within a day. Pakistan, the envoy from Bangladesh arrived with a warm welcome. arrived with red carpet treatment. relationship with Bangladesh might cause the government of India. been some positive steps between the two sides since the 1971 war. doubt that the other side was preparing for war at that moment. has a very weak economy with a GNP of approximately $12.5 billion. 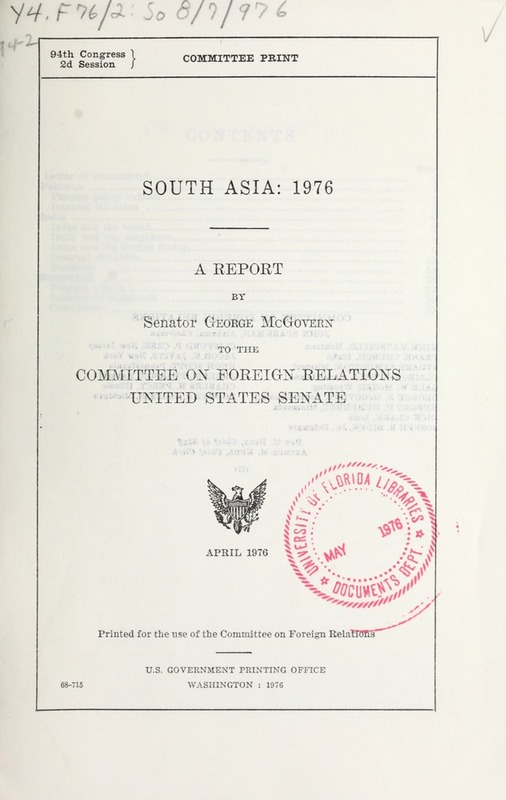 dollars and disbursed $500 million to Pakistan in fiscal 1975.
service alone takes more than one-fourth of foreign exchange earnings. support as well as to the Arab states. tion was the purchase of some TOW anti-tank missiles and launchers. chips higher and higher to no avail. tinuing deficits-it is also a potentially destabilizing step. national community following the 1971 war. t nil police and the central security force. institutions which could outlast him. There is no heir apparent. ture if it is to make substantial progress in a number of areas. too much too fast without adequate preparation. of developing a competent and effective bureaucracy. for instance, there may be more Pakistanis than natives. that the British health services would fall apart if the Pakistanis left. (I'en. Tiw is about one percent, of the spending for the United States. Pkistan's next door neighbor Iran is doing about 20 times as much. the industry, which helped to break the power of the big industrialis-t-. assets small to avoid nationalization. cotton-have b-en improved, but Pakistan could do much better. nology, does three times as well. common. In Pakistan, the yield is about eight bushlels an acre. water by 80 percent and quadruple the electricity-generating potential. (only half of the villages have road access). Pakistan spends roughly $12 million for 50 million people. often would be controlled or cured as a matter of course. mately 80 percent of Pakistan, 70 million people, live in rural areas. children to take care of them. and other nations, Pakistan can become a viable, self-sufficient nation. the latest Russian military equipment. States for criticism. Relations between India and China now are cold. suring its small neighbors in line with China's geo-political ambitions. control of the situation and may find itself in difficulties. the human race whether one has difficulty with them or not." the Indian approach to military activities. particular the superpowers, will react. with the Indians claiming that the Pakistanis are building up for war. One senior official said, "there is no doubt about it." see as dangerously clo-e ties with Pakistan or China. Another war in the subcontinent would be an unmitigated disaster. the Indians as to Pakistan's intentions in regard to Bangladesh. the indications to me that they also were prepared to be forthcoming. effort for relations to improve in any significant and enduring way. change in the attitudes of Americans toward India. Some years ago. off, that what happens in and to India does not matter to us. other nations with similar problems. States involvement is usually very clear. of United States activities in India. To the best of my knowledge. no covert operations directed against India. direct evidence of any United States involvement. successful. The initiative should always lie with India. lizer and for a share of the costs of expanding fertilizer production. marily to support a school lunch program. its dealings with India of about $750 million. tional Development to re-evaluate this drastic change. take the step of formally delaying national elections. leaders are as opposed as ever to social and economic programs Mrs.
she will probably feel obliged to opt for more suppression of dissent. would, in the long-term, aid the opposition. newspapers we read while we were in India clearly supported Mrs.
can be a very perilous one in terms of long-term stability. willing to allow growth at social cost. arrangements with the oil producers for oil imports. and, in turn, cut crop yields. private sector if businessmen regain confidence under present policies. general, the more affluent and educated states have had more success. drastic measures, perhaps penalties, to keep the population down. Mrs.
taken before" in such matters as family planning. In February, Mris. ployees, curtailing benefits to those having large families. career people. This thinness is particularly apparent in the districts. to broad and effective programs. thousands of times over throughout India. in order to bring progress and prosperity to India. ly, less corrupt basis and the servants and trains are arriving on time. destroyed democracy but has made it more purposeful and meaningful. harassed and foreign correspondents have been pressured and expelled. legislative affairs is uniformly supportive of Mrs. Gandhi. Mrs. Gandhi has postponed national elections for at least a year. many of her most important backers, including the large laindholder:..
its feet if she is not to experience a steady erosion of support. perennial problems of sta ovation, malnutrition and underemployment. couples are practicing birth control. to be marked as a success, at least in material terms. leadership in all three countries. was some famine in 1974 as a result of summer flooding. elections promised in a vye-ar. The Sayem government remains in power. several years. would like to see some return to peace -nd progress. ,zrea, y %_ 1L A I.
it can govern itt.elf so that it c-n rule. a very cautious 1,asis by others than thlie material law administrators. directives have not been forthcoming. avoid( provid(ing that provocation. Unfortunately. L1;':. I'; :'s of ]n'li. in fighting inflation. The target had been a reduction to 8 to 10 percent. for December, 1975, was about the same as the previous December. been avoided for the second year and credit ceilings are being observed. being drawn down very slowly. and only in areas of primary concern to the regime. food grain production and to limit population. necessary for the huge November crop. However, with too much water. Bangladesh would cost in the billions of dollars. main source of irrigated water in the northern districts. The main November crop is produced on about 14 million acres. will expand as this program continues. between Bangladesh and India is the question of water in the Ganges. the water level and created water shortages. rural development funds going to support rich land owners. farmer is to have necessary relief. had as many as 15.000). middle classes to the neediest-particularly the rural poor. ance programs to the persons needing it most. ladesh will spend most of its foreign exchange financing oil imports. baby food, medicine and consumer goods for the middle classes. but four years after the revolution matters have not improved greatly. growing conditions rather than governmental success. be drawn out of its present morass. ance and better use of the aid provided. tempts to find peaceful solutions to the remaining outstanding i--ucs. difficult for the fragile Bangladesh economy to bear. difficulties that came in the wake of the 1971 war. ceptable alternative to attempts to live in peace with each other.